Bit of an of mixed post this one with varied topics, as I have been very busy with the new term at school (little painting done). First I would to start with some new figures for Poles from the 17th century. The photo here is from the website of a little known company called 'Bears Den Miniatures' in the UK. The company has just released a large range of Poles to fight their very nice Ottoman range. The figures may well not be to everyone's taste but these winged Hussars in plate armour fill a gap that is still there in the market. The new Essex Miniature ones are unispiring (and mine have already been converted to Muscovite Hussars) whilst the Old Glory heavy cavalry are way too small and no one in his right mind could afford Foundry Miniatures (and they are small as well). TAG said they may do some Hussars in plate later on but as they are about to start a large TYW project I don't see this happening for awhile, if ever (there is also talk of an Italian Wars range after the TYW). Anyway see this link for the new company http://www.bearsdenminiatures.com/28mm%20products.html I really like the Mounted command, Hussars, Tartars and small gun and crew whilst the Ottoman range has some very tasty Spahis and command on armoured horses, the foot figures are not really to my taste but the cavalry are very good and only cost 2 pounds each. 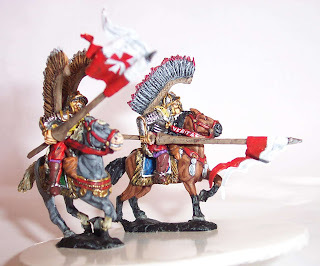 I will be ordering some Hussars very soon and will post a review if anyone is interested. It is good to see a sudden surge in interest in Eastern renaissance wargaming and especially new and excellent ranges of figures. Those who might be interested in the Transylvanian lists that I have posted for the Deluge period (very very pretty army), I obtained a great link from the Ottoman Wars Yahoo site posted by Rick Orli on the Hungarian and Ottoman cohabitation during the period 1500-1700. The link is http://mek.oszk.hu/01900/01911/html/index.html and contains some good images and information on the ill-fated Transylavanian incursion into Poland during the Deluge period as allies of Karl X and the Cossacks. On a completly different note I offer up a fantastic primary online source for the battles, uniforms and sieges of Karl X's wars in Poland and Denmark. During the Deluge period the Swedish king always had with him a very interesting character called Erik Dahlberg, whose writtings and drawings showed first hand all aspects of the campaigns of his King. Many of these drawings were used by Samuel Pufendorf to make a fantastic record (i.e. book) of the short reign of Karl X. These images always appear in the books that deal with Karl X and I thought I might see how much one of these would cost as it would be a fantastic resource. Anyway a quick search showed the cheapest copy going for 6000 Euros, so perhaps I might have to put it of awhile (Christmas present perhaps)? Here is the link online at a Polish University http://kpbc.umk.pl/dlibra/doccontent2?from=rss&id=3242 Have fun investigating the pictures, they have loads of uniform, battle and modelling inspiration. Finally it has been inspiring to see a Yahoo group set up to talk about wargaming and the military history of Eastern Europe. There has been a lot of great discussion yet one thread has interested me a great deal and that is the one on wargaming the Deluge period. Daniel Staberg, a keen Swedish gamer who has studied the period closely at University maintains that because of the superiority of the Swedish army and the ad hoc basis of the Polish armies the battles will always be a one sided affair. This got me thinking because whilst this is true on paper the fact remains that the Swedes did lose the war and many major battles. The largest defeat being one of the last ones in Denmark during the war, Nyborg which saw a large Danish, Polish and Dutch force smash a smaller but experienced Swedish army. Daniel has made several very interesting statements but I think that he has approached gaming the period in a very different way to myself. I am a gamer who is interested in researching, collecting and painting my armies but it is a game that I play at the end of the day not a simulation. Daniel I believe is a simulator who tries to recreate the many different variables present in an army and a battlefield. I too once liked this style of gaming and would like to take it back up sometime (Empire and Ancient Empires), but and it is big but, the rules take ages to learn and a good sized game takes forever to play (2 days). Many people like to get their gaming over in a 4-5 hour period as family, jobs and the pressures of the modern world interfere in our day to day world and gaming time. I would be the first to admit that WECW is not the perfect answer and that is why our group has taken ages to try and get it right. I think we have reached a happy medium for games under 6000 points and the mechanisms of the game can handle it in a reasonable manner. If you don't like a rule etc. change it so that all your gamers in the group feel happy. Gamers are a funny lot and we all have a different perspective on all aspects of the hobby but what has attracted me to the Deluge period is the huge variety of the armies and the personalities. The personality and career of Karl X just gets more and more interesting the more I read about him. Having spent several hundred dollars over the last few months on Swedish books I must say that the interest will coninue to grow. To finish off my ramblings I would just like to check if people would be interested in a basic introductionary work on the Deluge period? I have been working on collating wargaming information (regiments, uniforms etc. ), on the Swedish, Danish, Brandenburg, Muscovite, Cossack and Transylvanian armies and a basic overview of the campaigns. I would simply post it on this site as a link, but it is a fair way off as I am only half finished. Until next time, keep painting and I hope to have those damn Muscovite lancers posted next time. Obviously Daniel and I disagree on quite a bit on the website, but I wouldn't put him in the simulator category rather than the gamer. I think, as you point out, he has a different perspective, a pro Swedish point of view, that affects his judgement. If I understand your distinction between a game and simulation I think you can have both...you don't have to pick one over the other.